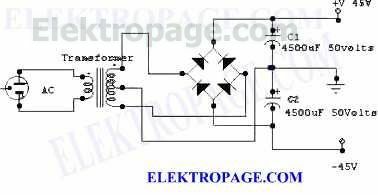 This circuit works amazingly well and is cheap to make. it is so simple that i have even built it ithout a PCB. you put in it so it also depends on what darlington's you use. 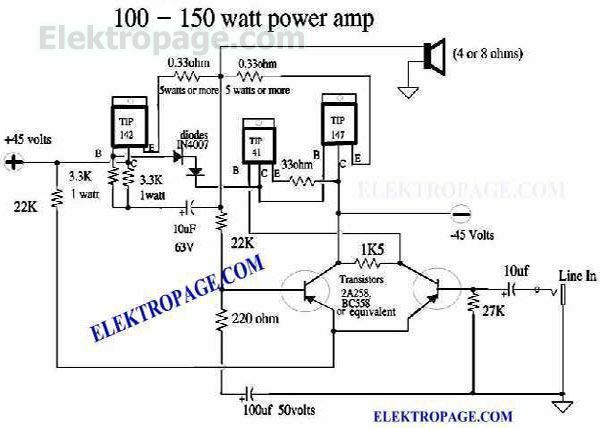 split power supply for 100 watt amplifier. The trnasformer primary is 110 Volt or 220 volt depending on your voltage. the seconddary is 35 V +35 V AC. Transformer should be about 4 amperes. once it is rectified you will get about 45 V + 45V DC volts. the diodes should be rated at 3 amperes and for at least 100 volts.